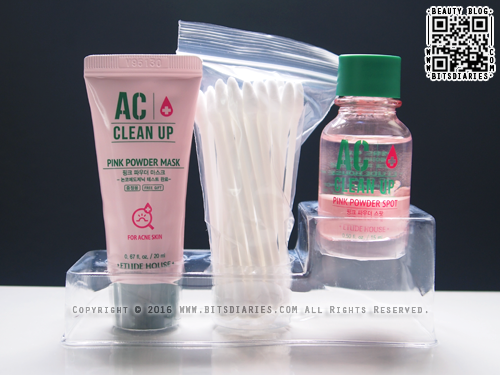 The new Pink Powder Spot Set comes with a sample size tube of Pink Powder Mask and a packet of cotton swabs. P.S. : I will be doing a review on the Pink Powder Mask in another post very soon. So if you are interested, stay tuned to my blog~! 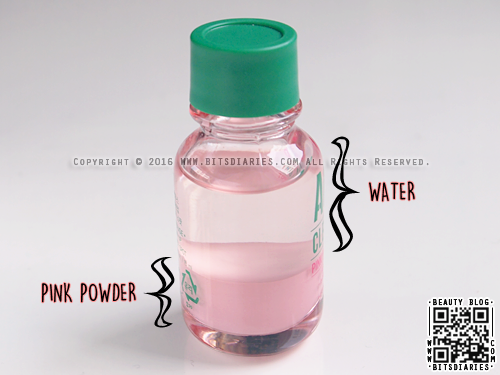 The pink powder spot comes in a glass bottle with a plastic twist off cap. 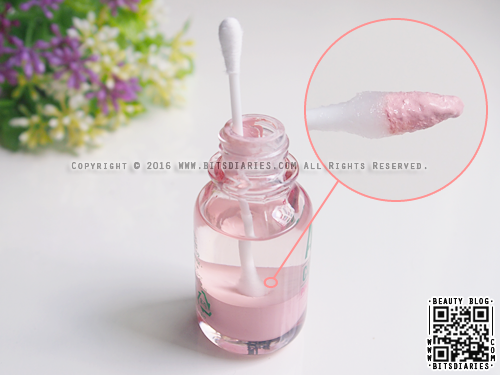 It has two layers — Pink Powder and Water. 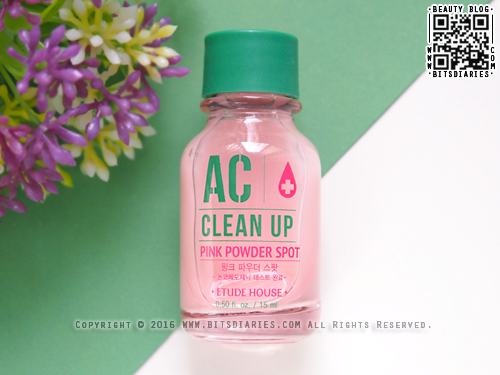 The pink powder layer contains calamine and sulfur which act as antibacterial agents that kill acne-causing bacteria. Whereas, the water layer contains chamaecyparis obtusa water with a mixture of salicylic acid, tea tree oil, alcohol and other anti-inflammatory ingredients that help to soothe inflammation and promote healing. DO NOT SHAKE IT! 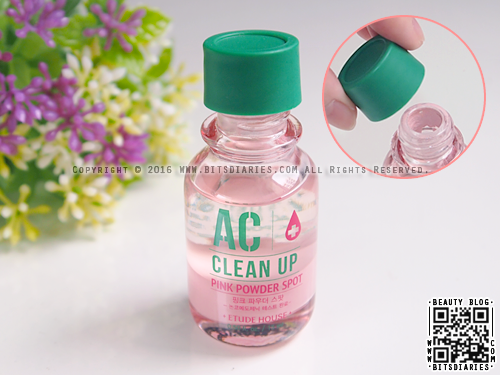 Simply dip a cotton swap into the bottle. 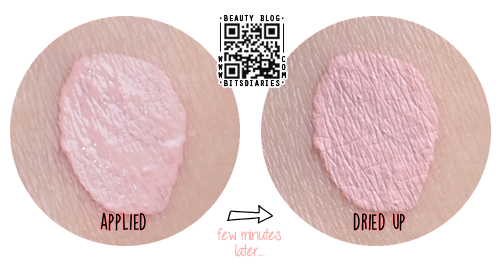 Allow the tip to get soaked with the water and powder, then apply it directly onto your zits. It dries to a chalky pink powdery finish, so I usually use it at night. My pimple looked smaller and less inflamed after a day of use. It dried up on Day 3, and on Day 4, it fully flattened out and healed. Note: The healing time may vary depending on the type of acne. What I love about this product is that it gives fast results! 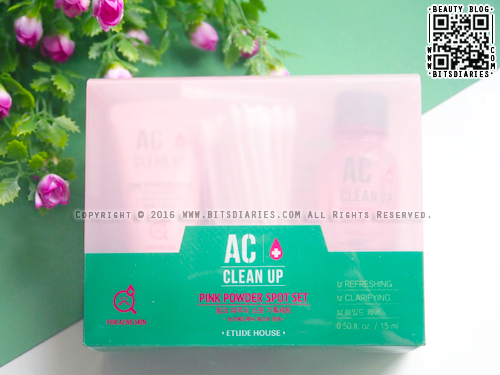 Another thing I love about this product is it gives a cooling sensation that instantly soothes pimple soreness. Overall, it is effective and efficient in treating pimples. I highly, highly, HIGHLY recommend it to all! I was looking at purchasing the set as I do still suffer from acne but it hasn't been quite as bad lately, may still do just as a back up in case! I'm impressed with how quickly this has worked and how effectively! Always a little skeptical but this looks like a genuinely great product! Plus Etude House always giving us cute packaging!